Tina Jackson, recipient of the Hollywood Chapter NAACP Image Award in Best Performance category, now decisively and deservedly holds down the role of lead singer with Robbie King & The Blues Counts. Tina's biggest musical influences have been her own musical family, Ella Fitzgerald, Chaka Khan, Mahalia Jackson, Al Green, and Nancy Wilson. Traditionally, Tina has written songs from her heart, playing acoustic guitar and pounding out melodies on the piano, performing her originals in coffeehouses, and small intimate venues. As her career in music and theater developed, she eventually began writing songs for other performers. Now, with Robbie King & The Blues Counts, Tina has come into her own with regards to the Blues. 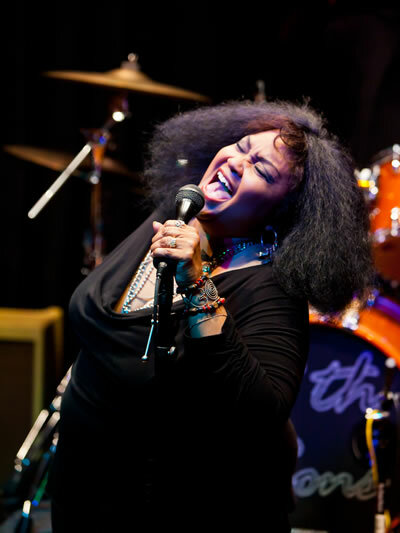 Her performances are gut wrenching and her vocal talents can stand alongside the best of the Blues divas. Monterey Bay Blues Festival, Monterey Bay, CA, with Yolanda Adams, Tommy Castro, Buddy Guy, Ben E. King, Shemekia Copeland, The Whispers, Lil Jimmy Reed, Buckwheat Zydeco, Sai What, Delbert McClinton, Denise LaSalle, and Eddie Cotton Jr. Copyright © 2012, Robbie King. All rights reserved.